We are using a “shared responsibility” model for QSL management. Our cloud based fully integrated Log Search / OQRS / QSL management application was developed by our team. All OQRS submissions are automatically processed and queued for printing and/or LoTW upload. Your cards mailed to the Direct QSL address will be handled by the management team. All cards will be dispatched from the United Kingdom. We are NOT using Clublog. OQRS available now CLICK Here. If you must mail us a QSL card please use the below address. Busted Calls, Not in Log and Missing Calls will be handled after the DX-pedition on an individual basis, see below. 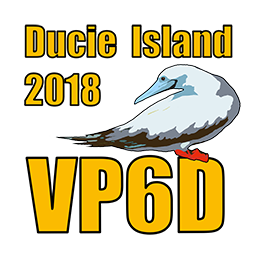 Any person donating US$50 or more to the Ducie Island 2018 DX-pedition, will receive early LoTW confirmation plus will automatically receive the QSL card by mail. These donors do not need to request QSL cards or take any action to redeem the QSL. The QSL manager will mail these cards to all $50 or more donors as soon as the cards are ready. Any person donating $200 (USD) or more will enjoy the Donations of $50 benefit plus receive a memento from the team and be identified as a Premier Donor on the web site. Will receive our newsletter “The Insider”. Mailed anywhere in the world. Unlimited confirmations per call sign. LotW upload will be processed within 48 hours for unlimited confirmations. Do not send us YOUR QSL card via the Bureau! Please help save Bureau costs. Only include requests for VP6D any others will be discarded. Confirmation requests received with insufficient funds may be returned via the Buro. Please use OQRS to submit your QSO details for a free bureau card. Do not send us YOUR QSL card via the Bureau! We pay for incoming Bureau cards, please help reduce our Bureau costs. LoTW will be uploaded 6 months after DX-pedition. - Use the OQRS system Log check request function. We accept online log check request only. - Please check your computer UTC date / time before asking us to research the problem. - We will research the log and contact you as soon as possible, AFTER the DX-pedition. Please, DO NOT send e-mails to any team member or pilot regarding Busted or Not in Log Calls, they don't have the logs, e-mails will not be read.